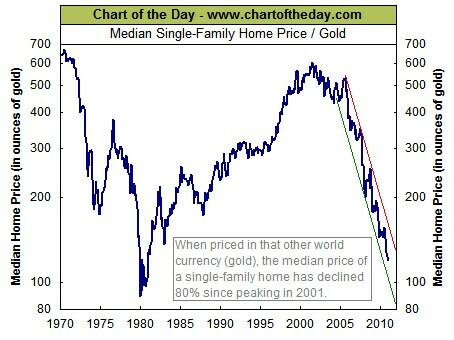 charles hugh smith-Priced in Gold, Is Housing a Buy? Corrospondent Bart D. has charted some relative values for essentials in Australia, and I will share his fascinating charts next week. Inspired by his work, I have done some calculations on U.S. prices of bread, housing, oil, etc. as well. Meanwhile, at least one respected analyst has set a target for gold of $5,200. Louise Yamada called the turn in gold in 2000-2001, and set a target of $1,500/oz years ago. Thus her technical targets should not be dismissed out of hand.